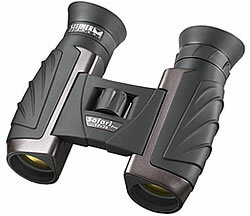 With the visible extra magnification, The Steiner Safari UltraSharp 10x26 will bring your observations as close as you would expect with a much larger pair of binoculars. The new high-contrast optics shine with high-contrast, natural colours and astonishing clarity. Magnification - 10x, Weight - 297 g, Width - 116 mm, Height - 120 mm, Depth - 46 mm, Exit Pupil - 2.6 mm, Luminosity - 6.76, Twilight Factor - 16.12, Field of View / 1000 m - 101 m, Close Focus Range - 3.5 m, Waterproof - Yes, Eyecups - ergonomic.